Bhutan is renowned for the enduring strength and vitality of its traditional Himalayan Buddhist culture and the dominance and purity of its natural environment. This journey through the country’s west encapsulates both these elements. Touring the major historical centers and day hiking to other important sites are combined with stepping off the beaten track, into a world that not long ago existed throughout the country and for many still represents the norm. There is a particular emphasis on traditional arts and crafts, observing the perpetuation of skills that have been carefully maintained through the generations. Your trip starts in the fertile tranquility of Paro valley, moving onward through the carefully modernizing capital of Thimphu, before crossing over to the Punakha valley. 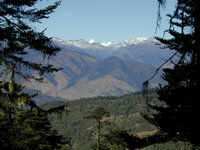 A clear day will reveal folds of hills rising towards distant snow-capped Himalayan peaks. Guru Rinpoche and the Shabdrung, Bhutan’s most celebrated historical personalities, will become increasingly familiar. Then begins a three-day trek following well-worn trails past quaint isolated hamlets to become swallowed up by the surrounding ecological riches. This transports you to another age, when man, humbled by nature, led a simpler, more devout and less complicated existence.